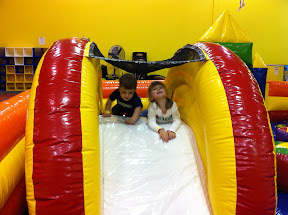 Yesterday we took Alyce and Luke to Monkey Joe's for a fun evening out for Alyce's birthday. For the both of them it was their second time. The first time there Luke enjoyed himself but wasn't so sure on his feet. 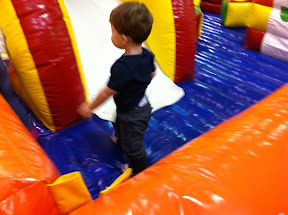 This time around with the whole place ourselves Luke handled all of the bouncy houses like a champ. Also improved this time around is Luke's ability to climb up and over the slide in the kids area. One thing that is kind of scary is that Luke is only 1 inch away from being able to ride the big kid two story high slide. I'm not sure we'll be pushing that one.